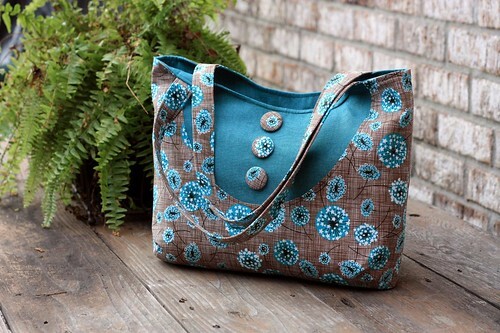 Another pattern re-visited, this time the Ava Rose Tote. And it's mine!!! My lilly tote is looking a bit rough (I'm too tough on light colored bags!) so it was time for something new. Oh man, I love this bag. As you can see, it didn't take me long to fill it with all my stuff. Not too big, not too small, I had forgotten how much I like this pattern. I didn't follow my directions exactly on this one. First off, I made 2 pockets (I know, crazy stuff), one on the inside (as written), one on the outside. For that outside pocket I cut my pattern piece to give it a slight curve. Nice touch, huh? I also added the extra touch of top-stitching around the bag front and back - I didn't bother on the lining. I like this look. To do this I pressed the seam allowance toward the bag body, then sewed. It's easy when you only have one side of the bag made, but gets a little tricky when you're sewing around that second side. I interlined this one with my new favorite interfacing material, canvas/duck cloth. It was just enough to give the bag some body without making it too stiff - perfect. I'm pretty sure the darker color will help me carry this one a little longer than the last, I hope. Apparently I was in the mood to sew last night! A quilt top, a quilt back, AND a bag all in one night? Watch out!! After a totally lazy Saturday, including sleeping late, movie watching, and naps, I got busy with a little sewing. I finally sewed up the Erica Bag I cut out weeks ago. 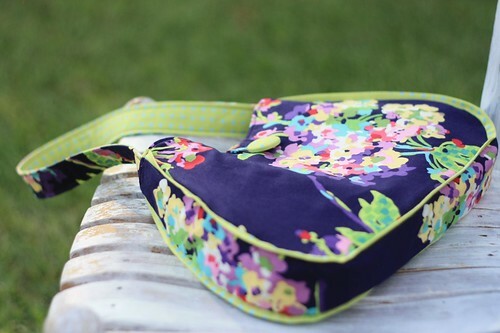 I tried something a little different while sewing this bag - I moved my sewing machine into the living room so that I could sew and watch the USA play in the World Cup quarter finals, what a game! I don't know why I never thought to move my sewing machine in there before...it sure beats sewing by my lonesome upstairs or in the usually-too-hot kitchen. Okay, back to the bag. I didn't make any mods to the pattern, just made it as is. The only fancy thing I added was some flat piping along the gusset made from my lining fabric. 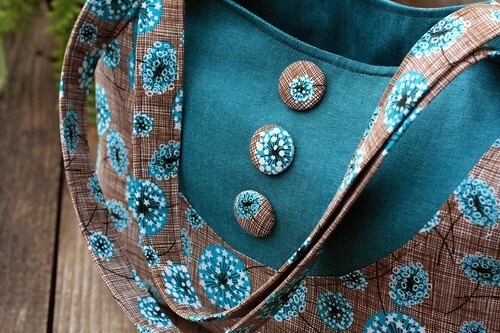 The little extras like piping and trim really make a bag, don't you think? I'm usually too lazy to add such details, but I'm usually pleased with the results when I do. I'm a little embarrassed to admit this, but I think I've *finally* figured gussetted bags out. The key is to pin the heck out of them!!! In the past, my gussets never lined up right. It seemed like no matter how hard I tried, they ended up shifting resulting in crooked gussets that don't line up right. So frustrating! But with a bajillion pins, a straight gusset is possible. There was also a little sewing that took place last week. Last weekend I was in the mood to make something quick and easy, so I made a few zippered pouches. I was in a lace mood. One of these went to Cathy, to hold a little gift I made for her birthday a few weeks ago. I had plans to blog about the gift back then, but it took until this weekend before I gave it to her. Darned busy schedules! Miss Ava also got a new dress. 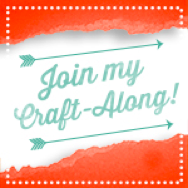 You can read all about it on Sew Mama Sew. 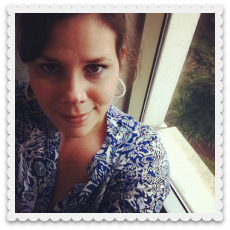 I wrote a book review for them for Jennifer Paganelli's new book, Girls World, which I loved. I think the review should be up on Monday. I thought I'd get around to sewing up another bag, but cutting it out was as far as I got. Hey, better than nothing! Once I get finished revisiting all my patterns (only 2 more left), I'm moving on to my too many quilts in progress, some of which I haven't touched in years. I'd love to make this baby a quilt, but there's too much unfinished business hanging over my head. I'll get there, slowly but surely!!! 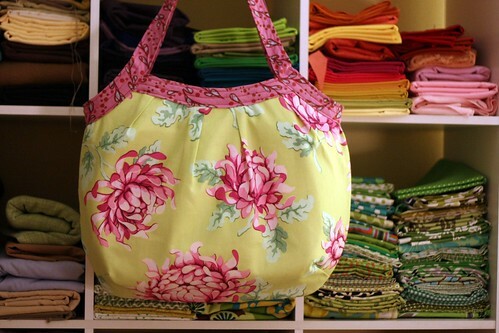 This time around I made a Pretty in Pleats and a Market Bag. I know I said that I was going to make an Erica Bag, but I got sidetracked. 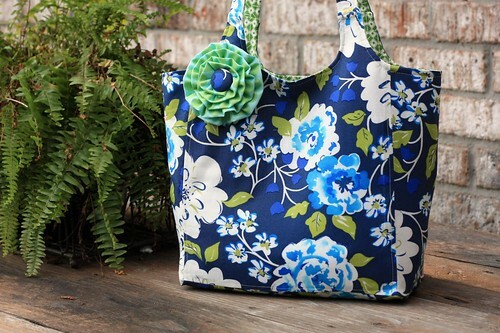 Once I got the idea to make a Market Bag out of that green fabric with a big flower brooch, I had to make it now, but I'll get to that in a bit. For my latest version of Pretty in Pleats, I was feeling the yellow. To break up all that yellow I decided to add a band of gray. Doing so is very simple, just cut your pattern piece where you want to make a band, add a seam allowance to each piece (I used 1/4"), then sew it together. You should end up with a top piece the same size as the original, as long as you were exact with your seam allowances. Again I went with a covered button. Love those! I also used canvas as interfacing. The canvas I use is plain old canvas/duck cloth you can find at any fabric store. Nothing fancy. Okay, now on to the Market Bag. I LOVE this bag. Yes, it is super huge, but I think I'm going to use this one. I always bring a a big bag to work with me that carries the junk I don't want in my purse - my planner, some magazines, maybe a project I'm working on, my lunch. This bag just might be that bag. When I designed this pattern I had sheets in mind. All my prototypes were made from sheets. I included fabric requirements for regular 44" fabric if that was what you wanted to use, but I had never used that. I don't know what took me so long! 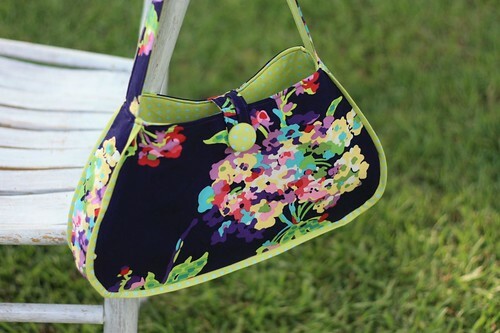 I made this bag completely reversible. Isn't that lining perfect for that floral? It's been in my stash for a while, but I didn't know what I'd use it for. This proves that if you wait long enough the perfect fabric will come along. And now I'm kind of hooked on making these flowers. Don't be surprised if you see more flowers on upcoming bags! Next up - Erica Bag and Ava Rose tote - I'm on a roll, I tell ya!! While I was working on my bags this past weekend, it occurred to me that you might find it helpful to see how I use my patterns. Most of most of my patterns have half pieces (I try my best to fit them on one 8.5 x 11 page, or at least break them up in logical places). If you're not a fan of placing pattern pieces on a fold, then you can print two pattern pieces and tape them together. 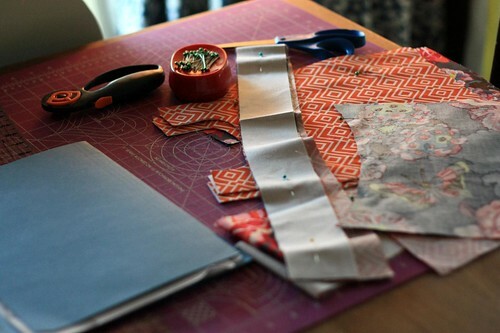 With bags, I find it easier to make a whole piece so that I can easier control the placement of the fabric design. It drives me nuts when something is off center! When you do this, one of your pieces will be upside down, which means that you won't be able to see the markings on the right side. To fix this, just trace over the pattern markings (pleats, darts) with a sharpie on both printed pieces. The ink will bleed through to the other side, making the marks visible on both sides of the pattern. When marking darts on my fabric, I generally do all my pieces at once. I stack up all my pieces, lay my pattern on top, and pin it in a few places to secure it. I stick a straight pin at the point of the dart them mark each point on all the layers with a plain old pencil. For the legs of the dart, I fold back the pattern a bit to mark those points. That's it for now. It's nothing earth shattering, but it may make your bag making process a little bit easier. One of my goals this summer to make new samples of all my patterns for a fresh look. I'm just plain tired of looking at the same old pictures! I'm starting with the oldest, working up to the newest. This weekend I tackled the Lily Beth and the Short & Sassy. I had forgotten how fun the Short & Sassy bag is. After being on a big bag kick for years, it was nice to make a smaller bag. Lily was in love with it, in fact she wanted it for herself. She said it was just her size. The ruffle was added for a little fun, along with the covered button. I love ruffles and covered buttons! Apparently I was feeling hot pink because both bags are drenched in it. 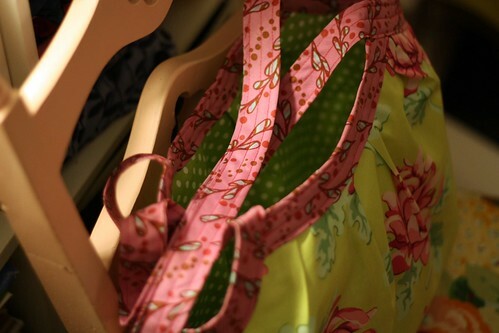 I love all the fabrics I used, but I especially love that pink and orange print on the Lily Beth. 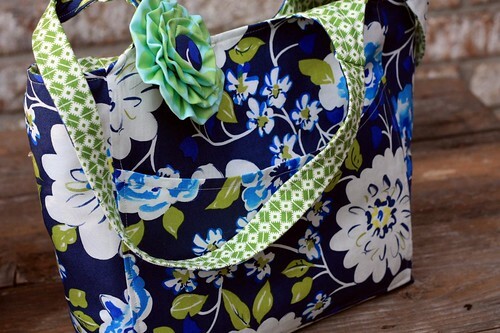 Both the fabrics on that bag are by Jennifer Paganelli. After my success using muslin as interfacing on my applique bags, I decided to try something different on these - I used canvas as the interfacing. Oh my goodness, I love it! It's no secret that I'm not all that fond of interfacing in general and I absolutely hate fusible interfacing, so I'm always on the lookout for other alternatives. I think using canvas for is a perfect solution for me. No, it isn't the cheapest method out there, but so far I'm happy with how the bag feels - sturdy and durable without feeling stiff. I'm going to play with this idea a little more before I become a total convert, but I'm on the way there. Okay, now here's a little bit of crazy...I must have a really bad memory, or big lack of self-confidence because I impressed myself with these patterns. I know that sounds strange considering that I made these patterns, but I went into this project expecting these patterns to not be so good. They were my first, made 3+ years ago, and I've learned a lot since then. Much to my surprise, these first patterns were well made! It's funny how we can skew things in our minds. I'm glad I decided to revisit these first patterns because they've given me the boost to finish up the two new patterns I have in the works! Now that I'm in the bag making mood, expect more in the near future. Up next, Pretty in Pleats and the Erica Bag!! I did it - I put my Lilly squares to use! Simple, colorful, fun - my kind of bag, for sure. Honestly, I'm surprised that I finished it as quickly as I did because follow through hasn't exactly been my strong suit lately. I suppose really liking the project had everything to do with it :) And just maybe now that I'm well planted in my 2nd trimester a teensy bit of energy is returning. Maybe. You don't have to worry about me not using this one. All my stuff is already in there. I even got crazy and added 2 pockets in the inside. I don't have a problem with pockets, really, but I'm usually too lazy to make two. 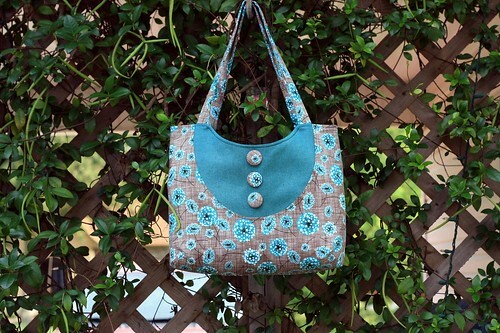 See how I incorporated the woven element in this bag? After my little brain storming session on my last bag post about using straw bags in the summer I had to do it. Thankfully, I remembered that I had these straw colored burlap straps in my stash (already made up) that turned out to be perfect. To carry that theme further, I added some flat burlap "piping" in the seams. I suppose I can't really call it piping because there is no cording in there, but you get the idea! Okay summer, now that I have my summer bag you can begin! TGIF and Happy Memorial Day weekend friends! Hooray for power naps! I do believe this may be the solution to my problem. Who knew that a quick 15-20 minutes of rest could make such a big impact? The other day I got the change to take such a nap. After a quick little snooze I felt revived, less grumpy, and I had the energy to spend a little time in my sewing studio after the kids went to bed. A win-win situation, indeed! 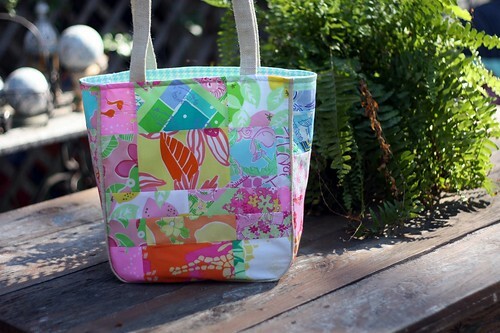 I am happy to report that my new summer bag is complete! Well, it may be my new summer bag. Every bag I make I think is going to be for myself. I’m a bit ashamed to admit that I’ve been carrying a cheap Tar-jay bag for a few months now. It was a weak impulse buy, but since then I’ve been itching to carry one of my own bags. I’m not sure if this is the one, but it is certainly on the right track. Now that summer is almost here, I think I may need something larger, more tote-like. 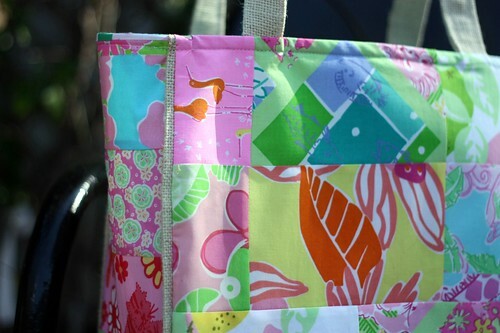 Those Lilly squares may end up being for my own bag instead of a beach bag. 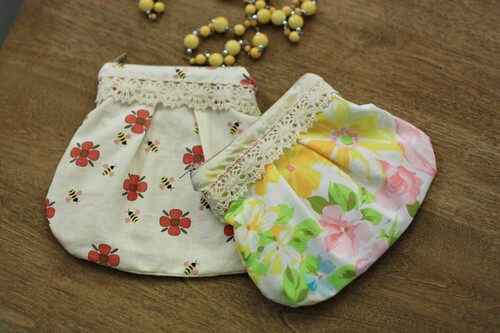 Before I started making bags, I used to get a big straw bag for summer. 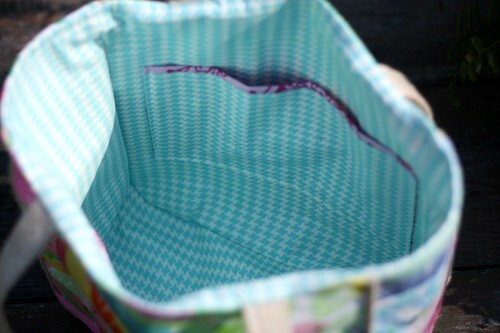 Maybe my summer bag needs some straw in the form of woven handles. 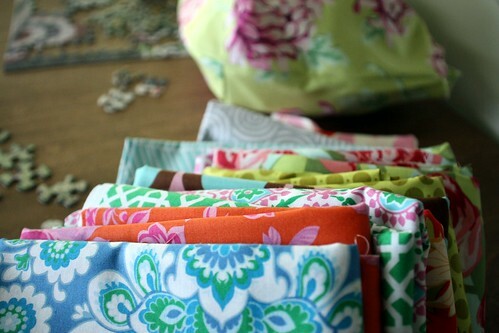 Yes, I can see that with some patchwork Lilly… Or, maybe I’ll make myself a tote style bag out of these same Jennifer Paganelli fabrics that I love so much. 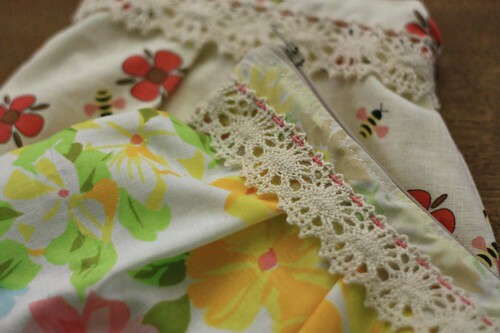 I really do adore these fabrics. See how I just talked myself out of this perfectly fine bag for something different, which at this point is just an idea I my mind? This type of dialogue goes through my head constantly. Yeah, I think it's a sickness. On an unrelated note, 5 of my magazine subscriptions arrived in my mailbox yesterday. Thank goodness it's the weekend with not much on the agenda - I've already enjoyed one long nap today, and now I'm looking forward to some magazine reading and bag pondering (I'm going to pretend that there isn't a mountain of laundry to tackle). Enjoy the rest of your weekend, friends!! Something I am happy about is that I'm starting to feel a bit inspired. Oh my, how I’ve missed that! My wheels have been turning and the sketchbook has been pulled out and doodled in, but unfortunately the energy to complete such plans isn’t there. 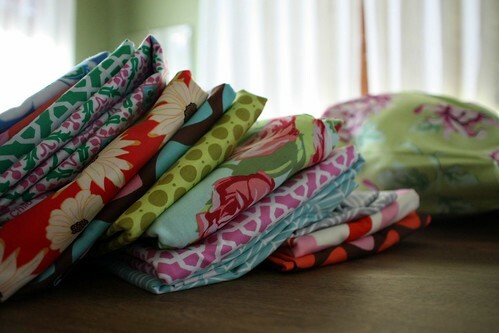 One sure sign that my creativity is returning is a fabric order I placed the other day. Gosh, it has been ages since I looked at fabric. I must admit, it was kind of fun. It was even more fun playing with it when it arrived. Though I haven’t completely felt like it, I have been making myself do a little sewing here and there. In the end, I know that I’m better for it. My latest creation is a re-visit to a design I came up with last spring when I did my Dottie Vintage collection. Instead of using regular straps, I decided to use wide bias binding as straps and trim. It still needs some tweaking, but that's no surprise (I like that part of the process). I’m thinking this will be my next pattern, after I finish up the two that are currently 99% complete. 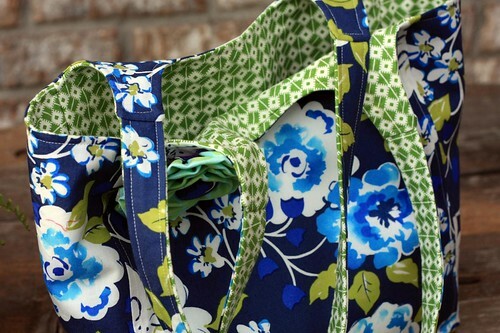 I’m such a dufus, it wasn’t until someone asked about a pattern for this bag that I remembered that I had started working on the pattern for these bags last spring. I managed to find the file, so I’m back working on that, when I feel like it. With those other patterns so close to completion I should be working on those, but what fun is that? I'm never one to complain about a happy distraction when the mood strikes! Pssst- there's a coupon code for my shop on my facebook page. Go check it out!! It took me way longer than normal, but I finished a bag in one day! Wahoo!! After looking through my stack of fabrics, of course I went with a bag. They're my go-to project of choice when I need a quick fix. A few months when I was cleaning out my studio I came across some Martha Stewart kitchen towels that I had purchased with the intention of turning into bags. Do y'all remember those? 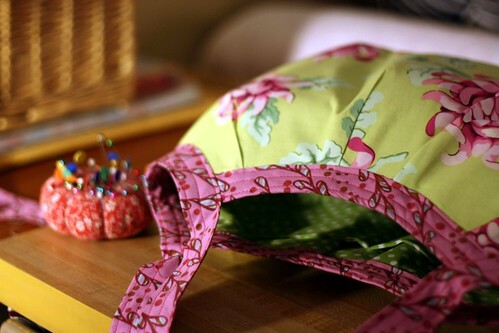 I made a few bags with the cocktail kitchen towels (holy cow, that was 4 years ago!! ), but I never got around to doing anything with these fruit ones. I suppose I was in the mood to do something fun and a bit different, so a peach bag it was. I like it! 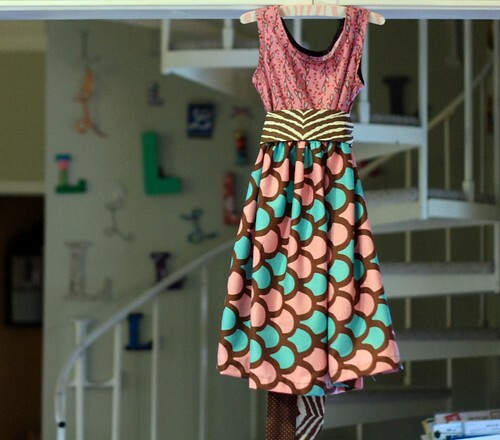 Lily, my almost-10-yr-old fashionista wasn't so impressed, but what does she know? I think it's fun and perfect for summer. 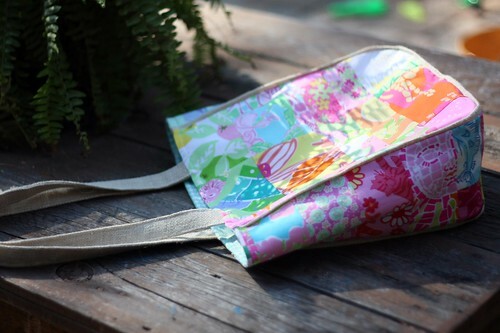 The warm weather months are the time of year to have fun with your bag, don't you think? There are a few more kitchen towels from the fruit series in my stash, so I don't think I'm quite done with them just yet. I feel like I played it safe this time, next time more pizazz! Bag making will have to go on hold for a bit because the kids and I have some crafting to tend to while they're out of school on Spring Break. If you haven't come across the blog tour for Jennifer Casa's new book, Teach Yourself Visually Crafting with Kids, I'm pulling up the rear. I'll have a post up on Thursday with our crafts and a review of the book. I can't wait to share!